ANDREW ROSS SORKIN: The next Fed about two weeks away. But on Wednesday, we got an interesting bit of news from the Central Bank, minutes from the Fed’s March meeting, showing some officials are leaving the door open for more interest rate hikes. CNBC’S Steve Liesman joins us now with a very special guest. MELISSA LEE: Well, you just said it. STEVE LIESMAN: No, I’m asking if you can say it. JOE KERNEN: I think -- you can sort of get away with that. STEVE LIESMAN: Can you say that? JOE KERNEN: I think you can get away with that. STEVE LIESMAN: What’s going on, Charlie? We—last-- we were down-- we were coming down for the count: recession was inevitable, the market had sold off. And now, it looks like the data is coming back. The market is up 16%. What’s your view on the economy and the outlook here? Is there a recession inevitable at this point? CHARLES EVANS: Well, Steve, you know, the data has strengthened a little bit in recent weeks. I think the first quarter is looking a little bit stronger than I might have thought at the end of December, early January, some weak data rolled off. So, you know, the economy is doing solidly, I would say. Fundamentals are -- continue to be quite good. And so, anybody who is overly concerned about a downturn, I was never really concerned about that. I do think that inflation is a little weaker than I would like to see given strong labor markets, lower unemployment rate, wage growth has picked up 3% to 3.25%. And a lot of fundamentals that support continued strength in the consumer. I’m looking for growth in 2019 on the order of trend growth which 1.75% to 2. So that’s decelerating from last year’s 3% growth. But, yeah, the economy is doing fine. STEVE LIESMAN: If you had to make your best guess as to the next direction of a policy move, which way would it be? CHARLES EVANS: I don’t have to make that guess. That’s the nice thing. I, you know, I submit a forecast. STEVE LIESMAN: Yeah, but that’s an interesting answer. You’re saying you’re firmly neutral. You don’t have a bias either way right now? CHARLES EVANS: You asked me if I had to make a guess. I don’t have to make a guess. I put in a projection of what I think appropriate monetary policy is that is underlying the forecasts that I have, so I said I have a forecast for 2% growth, say, in 2019. And it’s been decelerating. And I think that the unemployment rate is likely to go sideways. It’s at 3.8. Maybe it goes down a little bit. Maybe it doesn’t, depending on the labor force participation. What is a little concerning to me is that inflation has been underrunning 2%, and I had been thinking that inflation was finally going to be solid, hit 2% in a sustained basis. Maybe go over a little bit. That my projection. And on the strength of that, I had, you know, as recently as September and December thought that maybe a couple of rate hikes were in our future. Because inflation is a little bit lighter, the economy is doing fine. I think I said last couple of weeks ago that I can see the funds rate being flat and unchanged into the fall of 2020. For me, that’s to help support the inflation outlook and make sure that it’s sustainable at 2, or a little bit above. That would be fine, too. STEVE LIESMAN: So, is December looking like it was a mistake to hike rates? CHARLES EVANS: No, I don’t think so. I’m quite comfortable with the rate move decision, and everything that we said in December. Funds rate is at 2.25% to 2.5%. That’s what we’re targeting. That’s a good place to be with the unemployment rate at 3.8%. I think that that can support continued employment growth. I don’t know what maximum employment is exactly. I think we can continue to probe wage growth at 3% to 3.5%. It’s indicating, yeah, businesses tell me that labor market conditions are tight. They are having trouble finding workers. But they are bidding that up, and we keep getting employment growth. So I think that’s a good environment and until cost pressures lead to higher inflation, you know, I’m happy to sort of be data dependent and look at how things are playing out. JOE KERNEN: Steve, what were Fed funds in ’06 and ’07? Just a ballpark number. What do you think they were? STEVE LIESMAN: 5ish, I think? 5.25-ish. CHARLES EVANS: We topped out at 5.25. STEVE LIESMAN: 5.25. Yeah, right there. CHARLES EVANS: We had a big downturn. We had a housing crater. JOE KERNEN: We do all that. I always thought once we’re back to normal we step-wise go back to where we were normalizing. Go back to 5. And now it looks like that’s not the case. And I’m wondering is it, A) because we did build up a lot of debt that we don’t want to – we don’t want to go back up there because the debt service would really be prohibitively expensive. Or, I mean, compared to where the unemployment rate, is we should be back to 5 easily, shouldn’t we? We were never 3.8 before. STEVE LIESMAN: If you get a scatter chart, there’s no way you would put the unemployment rate and the Fed funds rate where it is. But Charlie will tell you. JOE KERNEN: But what changed? I don’t understand. CHARLES EVANS: Joe, that’s a great question. That’s a great set of observations. And what’s changed is the state of the economy. Labor force participation rate has declined quite a lot since 2000 and 2005 and 2006. This was anticipated. My own staff early in the 2000s looked at the demographic capabilities and noticed that labor forces would start declining. And so, you know, that would put pressure on the economy to grow at the previously higher rates of 3 or 2.75. Now labor force growth isn’t going to add to trend growth like it did before. We used to enjoy 3.25% growth during expansions from ’82 to 2007. Now we’re looking at 1.75%. Why is that? Well, I look for labor input growth best of circumstances going forward, about half a percent, and productivity growth to be about 1.25%. That’s a good rate. That’s higher than the productivity slowdown years of ’73 to ’95. It’s not as high as the golden years of ’95 to 2005. It’s in between. And that gets you to 1.75. So, in that environment, interest rates are going to be lower. That 5.25% funds rate back then was on the restrictive side. Now, we think neutral is about 2.75. And we’re on the low end of that. I’m okay with it. JOE KERNEN: What was the inflation rate, too, compared to the Fed funds rate? CHARLES EVANS: It was 2.5%. STEVE LIESMAN: Back then it was 2.5. CHARLES EVANS: Well, we’re about three-quarters percent below that. And expectations at that time were firmly at 2.5%. They sort of supported that, and we needed to do more. Now they are under that and we need to have -- be careful in order to get the expectations up. STEVE LIESMAN: Charlie -- how serious is your concern about inflation? STEVE LIESMAN: If your concern about inflation is strong enough, then that would lead you to additional easing, wouldn’t it? CHARLES EVANS: It certainly argues against premature tightening. It argues against moving to a restrictive position, prematurely. I want to look at the data. You know, the moment it looks like inflation is on the light side. It is. And expectations aren’t high enough. But I had -- you know, in September, thought that we’d in a better position if the data comes in. MELISSA LEE: Can you make a case for cuts right now? CHARLES EVANS: I mean, I’d have to be expecting some kind of negative shock which at moment I don’t see. I think it would be unexpected. I mean, most recessions are expected. CHARLES EVANS: We’re going along. The economy is doing well. There’s no reason to think that the expansion is going to die out of old age. The little pause could be the one that refreshes and we keep going. But I don’t want to go to a restrictive position prematurely. STEVE LIESMAN: Is the bar higher? Charlie, because the rates are so low, is the bar higher for a reversal of policy because you don’t have as much ammunition? CHARLES EVANS: I don’t think so. I’m not sure I understand exactly. STEVE LIESMAN: Whereas before you would reverse policy and cut, is the bar substantially higher now than it would otherwise would be? JOE KERNEN: If you do the math, it could go negative. JOE KERNEN: --go minus 5. CHARLES EVANS: --that it’s slowing down, you want to get out in front of that. At the moment I think things are going pretty well and I’m comfortable for the setting for policy. ANDREW ROSS SORKIN: What do you think, by the way? You’re talking about new math. JOE KERNEN: New math. You could go negative. JOE KERNEN: Keep cutting until you’re minus 5. JOE KERNEN: They do it in Europe, don’t they? CHARLES EVANS: No, they don’t go to minus 5. CHARLES EVANS: They got to like minus 40 basis points. CHARLES EVANS: That’s bad enough. ANDREW ROSS SORKIN: What do you think more largely about sort of this sense in Washington among Democrats and progressives that you can just blow out the budget and it doesn’t matter? ANDREW ROSS SORKIN: Modern Monetary Policy. MELISSA LEE: Modern Monetary Policy Theory. CHARLES EVANS: You know, so as sort of a research-oriented economist I would like to see a well-articulated model and I haven’t seen that. The best kind of analysis I’ve seen from that is, you know, along the lines of Paul Krugman and maybe Brad DeLong and others commenting about this. You know, there’s a line of thinking that goes back to Alvin Hansen, you know, back in the ’30s and ’40s about house, you know, it’s a state of aggregate demand that puts pressure on resources that can fuel inflation, to aggregate demand can be fueled by fiscal actions, and if you were able to regulate that in a particular way, perhaps you could use that. I think a problem with that, Chair Powell mentioned this earlier, is, that you know, you don’t normally look for Congress to do short-term fine-tuning. I mean, just the way you get to a bill and get it passed is really hard. So, that’s why you look to the Fed to do things like that. Plus, it’s monetary policy it’s inflation. It’s inherently monetary. STEVE LIESMAN: Charlie, the President commented again over the weekend about the Federal Reserve, saying that the market would be 5,000 to 10,000 points higher, I assume he means the Dow. STEVE LIESMAN: For sure. Yeah. Okay. If not for the Fed, how do you react to this commentary? Do you think it’s appropriate that the -- that the President comments the way he has been commenting on the Federal Reserve, and does it change your policy? 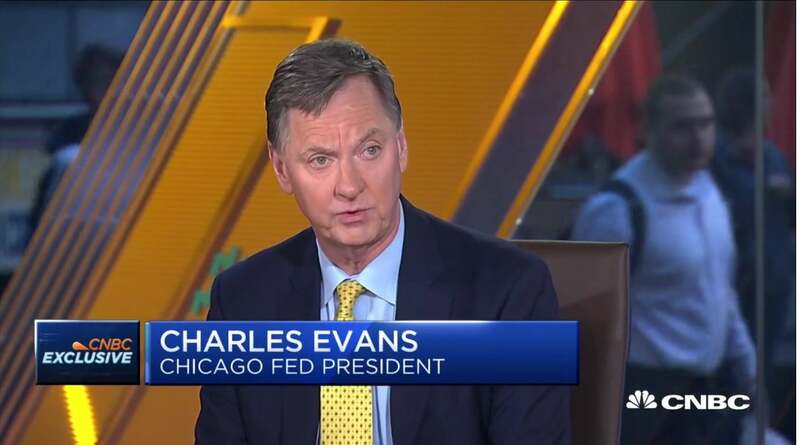 CHARLES EVANS: It certainly is the case that the Fed enjoyed, you know, a period of time since the early ’90s until recently where, you know, the administration was relatively quiet about the Fed actions. Even if they grated on them, they were relatively quiet. The Fed Chair and Treasury Secretary have breakfast and lunch on a regular basis, and I’m sure they exchange views there. But, you know, we ask for some degree of independence from political authorities. I think what comes to that, is you know, we have to be accountable. We have to explain what we’re doing, and we have to follow the mandates of the Federal Reserve Act which is to provide financial and monetary support to deliver maximum employment and price stability, and I try to keep my eye on the ball. ANDREW ROSS SORKIN: There has been a lot of commentary though over the past several weeks about the status, if you will, of the Federal Reserve. Just within -- as an institution. The credibility of the institution given some of the comments that the President has made. MELISSA LEE: Such as Mario Draghi comments over the weekend? ANDREW ROSS SORKIN: But I was also going to say, the nomination of Herman Cain, the nomination of Stephen Moore. You’ve read those stories. People lamenting the credibility, long-term credibility that they argue could ultimately be undermined by some of this. Do you have sympathy for that argument? Do you disagree with that argument? CHARLES EVANS: You know, it’s very much what I was just saying is, which is, you know, we have to pay attention to the data. We have to pay attention to our mandates. I think when, you know, we take some actions like in December you asked me, you know, did I agree? Was that a mistake? I’m willing to explain it’s a good decision. We can disagree over that. And since then the data softened a little bit, and now they seem a little bit, you know, stronger. I think that supports just sort of let’s be data dependent and look at how this will play out. And I have an idea it might take longer. Meantime, people are going to criticize us, and that’s the way it plays. As long as we continue to look at the data, can explain it relative to what we’re supposed to be doing, we just have to accept criticism. And if you’re in this and you don’t have a thick skin. Then you, you know, you really have to consider how to get -- how to grow a thicker skin. STEVE LIESMAN: Come back any time, Charlie. Thank you very much. CHARLES EVANS: Good to see you. STEVE LIESMAN: Guys, I read the Tweet. He could have meant the S&P. Could have meant it. JOE KERNEN: A million for the Dow. MELISSA LEE: Double where it is right now. STEVE LIESMAN: 5 to 10,000 on the S&P. Read the Tweet. It doesn’t say.